As something of a fan of funky handbags (shout out to Nila Anthony's seashells and popcorn cartons), there's already a certain something happening via Kelly Osbourne at MTV Movie Awards. Something pulling at every sartorial string in my aching heart: one duck clutch. 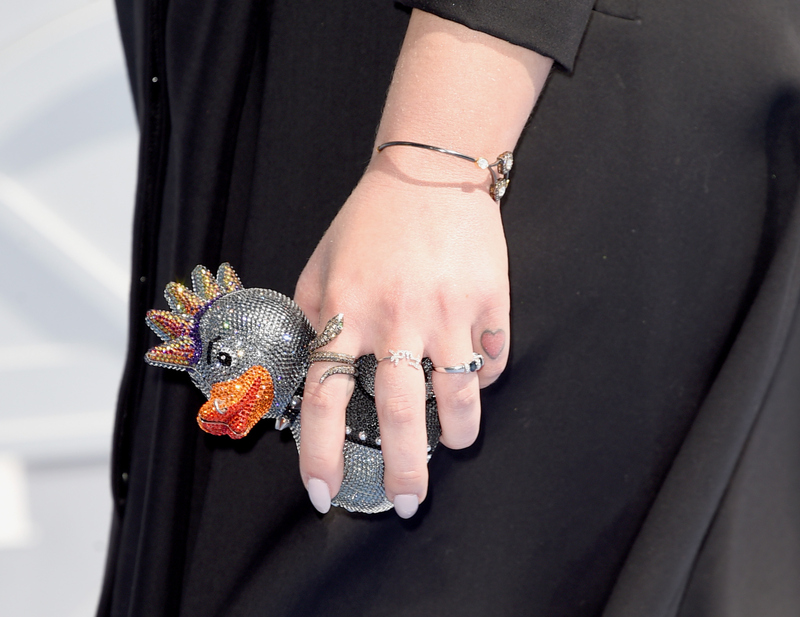 Yes, a clutch shaped like a bedazzled, pet-worthy, swoonable duck. And not just that, but a punk-rock duck — emo studded collar and psuedo-leather vest included. I've always been a fan of Kelly's. Her clothing collection Stories was the punk rock line of every plus and straight-size rocker chick in The Universe's dreams. And her departure from Fashion Police sort of solidified the role of "someone with her head on straight" that I'd always branded Kell Kell with. But her fashion choices — from purple hair to embellished shoulder pads — have definitely made me gush every time I hear her name. But this handbag, y'all. I'm a full believer in embracing toddler trends as an adult, and animal-shaped handbags are one sure fire way of doing so whilst remaining ultra cool (if your definition of cool is sheer un-coolness, like mine). There's nothing better than letting your freak flag fly (we all have one, people), and I adore that Kelly is never afraid of letting hers soar. Of course, purchasing the Rock-and-Roll Rubber Ducky bag will set you back $5,495, so most of us might be opting for the aforementioned Nila Anthony. Perhaps my beloved popcorn handbag, or maybe a big, bright eye. Does couture ever go on sale?